This mode has the ability to completely control the patients ventilatory status. With this mode you set the rate, the means by which tidal volume is obtained (volume control or pressure control), FiO2 and PEEP. For the purposes of this post we are referencing the Puritan-Bennett 840 Mechanical ventilator but other ventilators will be similar. In this mode the rate set will always be the minimum rate that will be given. The types of breaths that can be given by a ventilator are breaths triggered by the machine and breaths triggered by the patient. Breaths given by the machine are triggered by the rate set by the clinician. Negative pressure generated by a patient attempting to take a breath will trigger the machine if the patient wishes to take his own breath outside of the set rate. When the ventilator senses this effort (sensed as either a change in flow or change in pressure), a breath is delivered. The sensitivity set on the machine will determine how easy or how difficult it is for the patient to trigger this assisted breath. For each triggered breath, you will see a dip below the baseline on the breathing waveform (see below). If the machine delivers a breath that is not triggered by the patient, you will see a green “C” in the left top corner of the screen, symbolizing a “Control” breath. If the patient triggers a breath, you will see a green “A” at the top left corner of the screen, symbolizing an “Assisted” breath. In this mode, the rate may be variable because the patient is allowed to trigger breaths. However, the patient cannot change the tidal volume or pressure that is delivered. Regardless of whether the breath is assisted or controlled, the tidal volume or pressure that is set will be delivered. 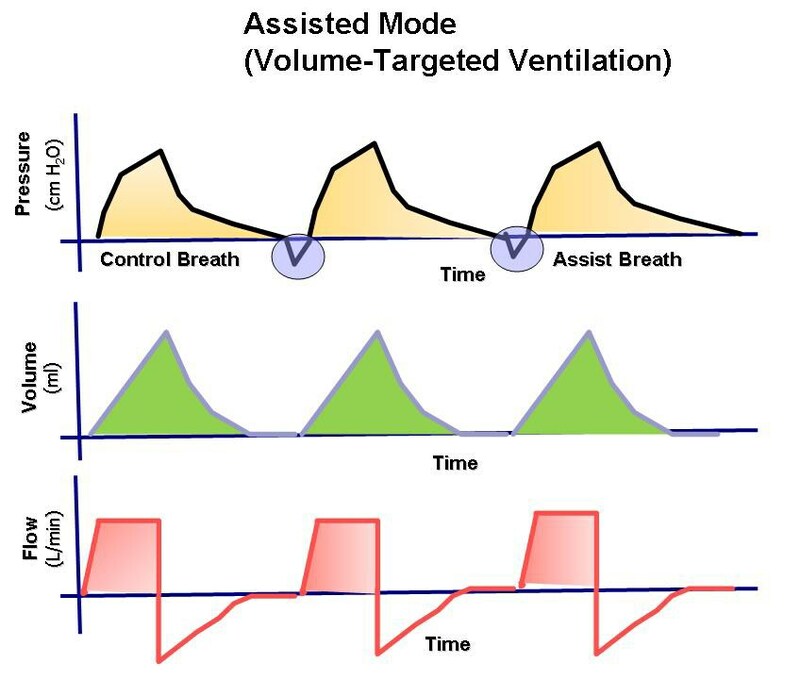 There are two ways to deliver the amount of volume in a breath on a ventilator; volume control and pressure control. Volume Control (VC)- volume set based on the patient’s Ideal Body Weight (IBW) with usual goal being around 6-8ml/kg. Volume delivery stops when the set volume is reached. Peak pressures will be variable in this mode. This is the more common setting in adult ventilated patients. Pressure Control (PC)- inspiratory pressure is set and volume is variable. Inspiration stops when the set inspiratory pressure is reached. So now when you hear AC/VC or AC/PC you now know it means assist control with either volume control or pressure control as the mode of tidal volume delivery. AC/VC = Assist Control Volume Control. AC/PC = Assist Control Pressure Control. Percentage of oxygen set based on patients needs. This can be chosen by starting at 100% and then weaning down at the bedside shortly after connecting the patient to the ventilator or starting around the percent of oxygen that the patient was requiring prior to needing the ventilator (if it was adequate). For instance, if the patient was saturating well on 50% FiO2 while on BiPAP prior to intubation and mechanical ventilation, this may be a good place to start and then titrate up or down as needed. Positive End Expiratory Pressure is the pressure set to help keep the airways open on expiration. This is customarily set at 5. Some have recommended 3-5 of “physiologic PEEP” for patients with an artificial airway. Small reductions in Functional Residual Capacity (FRC) can occur with intubation and this can be balanced with PEEP. In small increments, PEEP is also good for overcoming auto-PEEP in those who have obstructive lung diseases and have issues with exhaling completely. This setting also helps with oxygenation via alveolar recruitment. Remember that ventilation is the ability to remove CO2 with respiration and is distinct from oxygenation. It can be measured by PaCO2 or end-tidal (etCO2). Ventilation is controlled by rate and tidal volume. If your patient is retaining CO2, you can either increase their respiratory rate or increase their tidal volume to help blow off more CO2, and thus improve ventilation. The same is true for the opposite. If the CO2 is low, you can decrease the respiratory rate or tidal volume to help him retain more CO2. However, note that if the patient is already breathing faster than the set rate or “over the ventilator”, increasing or decreasing the rate may not change anything because the patient will continue to breathe at their preferred rate. Volume should be adjusted in these patients to change CO2 levels. Also consider pain or under-sedation in patients who are hyperventilating. Measured non-invasively with pulse ox or with invasive monitoring (PaO2). On the ventilator it is controlled by FiO2 and PEEP. If your patient is desaturating, it is customary to just increase your FiO2. The PEEP can also be increased to help with oxygenation by alveolar recruitment and by extending the alveoli and increasing their surface area for better oxygen diffusion. You may have noticed this in ARDS patients when the FiO2 requirements are increasing but oxygenation is not improving. PEEP is the next setting to utilize. You may reference ARDSnet.org for the protocol. There is a caveat, you may notice hypotension in patients with increasing PEEP requirements due to decreased venous return from all of the positive pressure delivered to the thoracic cavity. On the flip side, if the PaO2 is substantially high, you can decrease FiO2 or PEEP to help decrease your PaO2 to a more reasonable range. Amitai, Allon MD. “Ventilator Management.” Medscape. Oct 17,2017. https://emedicine.medscape.com/article/810126-overview. Nickson, Chris MD. “Positive End Expiratory Pressure (PEEP).” Life in the Fast Lane. Nov 13, 2017. https://lifeinthefastlane.com/ccc/positive-end-expiratory-pressure-peep/. Wilkins, Robert L. PhD, RRT, FAARC, et al. Egan’s Fundamentals of Respiratory Care, 8th Edition. St. Louis: Mosby, 2003: pg 951-954, 979, 1030. Dr. Ashley Binder is a PGY5 EMIM at UIC.